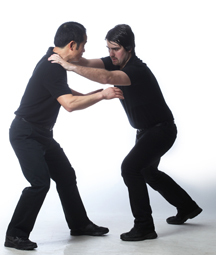 Junsado Fundamentals, Standing and Ground Combat is a comprehensive book on fighting, with an emphasis on effectively neutralizing and destroying your opponent in either standing or ground confrontations. Using training scenarios, it presents unconventional defenses against tackles, head locks, chokes, arm locks, punches, grabs, low kicks, sweeps, throws, pins and a variety of strikes. A fighter who attempts to tackle you is either an expert at ground fighting or is very inexperienced. The key to defending against a tackle is to redirect the assailant’s lunging force off your centerline. Once you pivot your body off the centerline, you are less likely to be knocked backward. 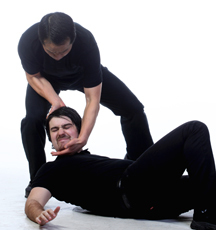 If your opponent is large and powerful, counterattack to a vulnerable area like the head or neck to disorient him. 1. As your opponent rushes in to tackle you, put your hands between the two of you and lower your posture. 2. Grab his hair or the top of his head with one hand and his chin with the other hand. 3. Use your grip on his head and chin to steer his body in the direction he is moving until you have solid control over his head. Then swiftly pivot your body away from him to spin him down to the ground. 4. As he falls, maintain your hold on his chin and head, flexibly adapting to the changing intensity of his fall. 5. When he lands, kneel on one knee behind him and secure his head in your arms. 6. Tilt his head downward to intensify pain in the neck and reduce his opportunities to strike you with his hands or feet. Caution: This head twist is extremely dangerous and can cause damage to the cervical spine in the neck. 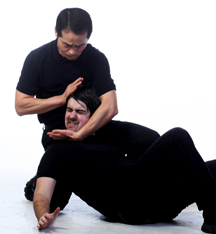 Use caution when practicing this with a partner, never applying the twist forcefully in practice, and only use this technique in self-defense when justified. When the opponent pushes you, pull his body in the direction he is already propelling himself. This will confuse and distract him. Then as you move your body out of the line of his attack, lower your stance and change the trajectory of the force. His body will continue moving as you yank his head in a different direction, causing him to fall. It is important to apply the headlock as soon as he lands, before he orients himself and recovers his balance to mount a counterattack. 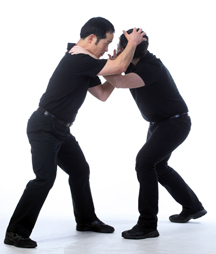 The scenarios presented in Junsado Fundamentals, Standing and Ground Combat are offered as examples of how to use Junsado skills in actual combat, but they aren’t meant to cover every possible action or reaction that could occur in a fighting situation. They’re simply intended to be used as a method of arranged practice to facilitate learning the fundamental skills. As you repeatedly practice scenarios like the example above, your body will adapt and internalize the skills, making them your own. Once you’ve mastered the practice scenarios, your goal is to move on to free practice, applying the skills in increasingly less structured situations so you can use them at will. 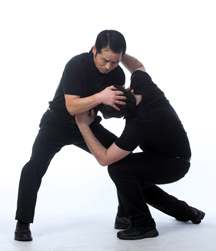 The above instruction is an excerpt from Junsado Fundamentals, Standing and Ground Combat. Junsado Fundamentals, Standing and Ground Combat ($5.99, over 650 full color photos) is available exclusively in e-book format for Kindle (Amazon.com), Android (Google Play store), Nook (Barnes & Noble), and iPad (Apple Store). 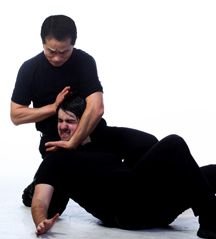 This entry was posted in Junsado Fundamentals, Self-defense and tagged article, fighting, fundamentals, headlock, immobilizations, junsado, junsado essentials, junsado fundamentals, principles, self-defense, standing and ground combat. Bookmark the permalink.